The past few weeks was only a shadow of such sadness that was. At this point, after acceptance takes over, acceptance that certain circumstances happen that we have no control of and be it sad as they are, its already something gone past us. Hope glows amidst the darkness of such sadness. Sadness is never a stranger but when hope accompanies it; though it merely tangles on a string as one song sings; the night does not seem to last long and dawn breaks when least expected. Talking about acceptance, it is not like an overpowered fighter who sighs out of defeat. It is acceptance that there are certain events that simply happen and though we do not have control over them, we do have the option to move forward and rise up from whatever dumps we have fallen into. Acceptance does not end with understanding and recognizing our frailty over uncontrollable things. It works hand in hand with hope because after we embrace the fact that it already happened and there's nothing we can do about it; we move forward to life and face the aftermath of whatever it was, whether it was caused by us or not. This thought made me remember a life-changing book I read back in high school. Great Expectations by Charles Dickens mirrors how we, when young picture life to be like a perfect canvass but often leaves us devastated when our hopes come crashing down to the reality that not everything happens according to how we want it to be. This does not imply that we be like Juan Tamad who lazily waits for a fruit to fall on his lap instead of exerting effort to reach it. It means we bend like a bamboo, flexible enough to be swayed to and fro. Instead of complaining, accept that which cannot be controlled and make the most out of it: learn, impart to others what had been learned, and move on. 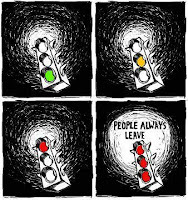 One Tree Hill "People always leave" which is once an insignia for a U.S. T.V. show is one factor behind the drama over the past few weeks. When we become too emotionally attached to people whether friends or co-workers, it is hard to let go when it’s time to do so. Yet as they say, change is the only thing permanent in the world so we should always be ready for it. It applies to everything in life: possessions, events, and even people. Loners have an advantage in their disinterest for all types of human relationship entanglements since there is no bond to be concerned with or be bothered about. For them, people's coming and going is as natural as everyday solitary experience. Although I am happy for those who are grazing in greener pastures now, I am not a loner as I pretended to be. I am pained by thoughts of parting and of letting go. If there is anything good that comes out of departure, it is the gift of a legacy. I am not talking about death. These people I have in mind are alive and kicking. Legacy is what they have carved into us like a potter shapes clay into vases of all forms, sizes, color, and design. We benefit from the influence of their character. We do not copy; we emulate at least a part of them and make it our own. We do not plagiarize like a writer stealing someone else’s work. We are inspired from the substance their art brings that we are obliged to write our own; otherwise, the lines we read from them is wasted. We write our own. It is distinctly ours: in lines and verses, in thoughts and ideas. A part of them maybe obviously noticed in the words we write but again, not due to plagiarism but because of influence. So much for the drama. Kudos to three great supervisors I've worked with! What can I say about the newest? Or all there are to come? Soon enough I’ll know. For now, it's not always as dramatic as One Tree Hill "People Always Leave" because it can be like hope, though it tangles on a string.